A reading from the gospel of John 1:43-51. Listen for God’s word to us. Who among us was taught at an early age to be curious? Especially about matters so momentous as encounter with the Divine. Movement of Spirit within. Beholding the Wonder of the World?!!! . . . Curiosity is the foundation of intelligence – not to mention an aspect that leads one off onto an amazing adventure through life. Consider a child who has inside the impetus to explore. Wander. Wonder. Even if that child doesn’t do as well as another who has rote memorization down pat for school tests; the curious child has a better shot in life at things like critical thinking, complex intellectual abilities, pure self-assurance deep down in their guts which leads to one being able to live their own life – not just swallow lies as fact. The curious child possesses the capacity truly to learn. To decide his or her own truth. To grow. To become. Despite the age-old adage that curiosity killed the cat, curiosity is one of the key ingredients to the life of discipleship. Only one who is curious would be willing to heed when a man from Nazareth walks through the scene saying: “Come see.” Only one open to seek would be able to find where he was staying, as the gospel of John records in the part of the story right before Philip and Nathanael experience their own encounter. Only one wondering if there might be something more than what other outer authorities say would be able to journey with a man whose words sound strangely authentic. The gospel of John begins with the beautiful declaration about the pre-existent Word of God – calling all things into being. Shining in the darkness. Born into the world with flesh and blood and the ability to be among men, women, and children in ways not fully beheld before. You might remember that the distinction between the Word and the man sent from God to make way for that word is woven together in the poetry of the gospel of John’s opening on the incarnation. John the Baptist’s testimony picks up next – his tangle with the Lawkeepers being outlined from the beginning. While he is surrounded by his disciples; the very next day, Jesus comes walking by. . . . Surely, the gospel of John makes a better theological claim than a geography lesson. The places named as locations on particular days hardly make much sense, unless Jesus is enlisting recruits for an Israeli power walking club. The story puts him first near Bethany outside Jerusalem. A few days later heading north to Galilee, where on the third day he attended a wedding in Cana, then head northeast to Capernaum, only to return south the hundred miles – most likely on foot – back to Jerusalem as Passover draws near. No birth narrative here. No angels announcing and dreams convincing or shepherds and Eastern magi on bended knee. No sooner does Jesus come walking by, than curious men – openminded men. Seekers, we might call them today, catch wind of this One and willingly join an adventure. They’re promised a path of witnessing. Beholding the work of God’s Lamb. Hooked, first Andrew and another inquire where he stays. Andrew grabs his brother Simon whose name right away is changed to Peter, and before all’s said and done one named Philip will find his friend Nathanael, inviting him on the uncertain voyage as well. Any perceived divide between heaven and earth is over, Jesus insists by his reference of the ladder climbed by angels from ancestor Jacob’s infamous dream. In their midst stands the full encounter with God. The Word en-fleshed to elicit response in the hearts of all who wonder. . . . Like the curious monkey named George in the children’s book series; the first few to be invited, seek. And according to the gospel of John, that curious nature is essential in disciples of Christ. After this service of worship, Hillwood’s Renewal Team will have its first meeting. Pray for the five church members who set out today on this journey. Commissioned this fall by the session – before we got all caught up on the events of Thanksgiving and Advent and Christmas, your Renewal Team has committed to taking key learnings from the Vital Signs report of Hillwood’s Church Assessment Tool to begin forging a new trail for this church’s future. Your input on the Church Assessment Tool is telling a few of the first needed steps. When I spent some time with those again this week, it struck me that four of the five top matters connect to curiosity. They include: individuals wanting to know their particular gifts for ministry. Members accepting the responsibility of life-long spiritual formation. Helping you each know you are called to God’s ministry as you venture forth in the world. And providing a variety of experiences for you to deepen your knowledge and love of God. It’s exciting to me that these emphases touch at least three of the six factors which make for vital congregations today: life-long learning orientation, education and formation for complex lifestyles, and one that might require a little more courage for some of us: flexibility – making changes needed for the current context with as much ease as humanly possible. . . . Certainly, the curious men who first came-long with Jesus have a word for us as we undertake the process today! In the few short weeks between now and Lent, we’re going to learn more of what they saw as they came along. We’ll hear the miraculous events they beheld. We’ll get their reactions – even be told how slow some were to accept. Our eyes remain ever on Jesus, God’s Lamb pointed out from the start by John the Baptist. But the curious ones who would follow also can capture our hearts. For if the first ones he came ‘round to invite were those open to the adventure of journey; certainly, he’s hoping for that very same curiosity in us today. Willingness to see where he’ll take us. Excitement that it’s larger than the way we already know. Wonder at what could be, despite evidence that wants to conclude otherwise. Perhaps curiosity can ignite in our spirits too. So that we keep on – or begin for the very first time – awakening to Spirit’s lead. Listening for what resonates within. Walking with eyes wide-open to behold what we’ve never seen before. With curiosity key to our being, ready to journey wherever he goes. This entry was posted in Sermons and tagged 14 January 2018 sermon, Call of Discsiples, Church Renewal, Curiosity, Curious George, Disciples of Jesus, Factors of Vital Church, John 1:43-51 on January 15, 2018 by RevJule. A reading from the gospel of Mark 1:4-11. Listen for God’s word to us. Have you ever been to a naming ceremony? We’ve heard of one these past few weeks in our Christmas readings. The event is so matter-of-fact that after all the hype of the angels and shepherds and birth out back among the animals, the gospel of Luke simply records: “After eight days had passed, it was time to circumcise the child; and he was called Jesus, the name given by the angel before he was conceived in the womb” (Luke 2:21). One little verse, recorded only in one gospel; tells us Jesus’ parents observed his naming ceremony. If you want to know what to expect today in a naming ceremony, just goggle it. Reformjudaism.org includes Rabbi Karen Companez describing “What to Expect at a Baby Naming.” Though the number of days after birth differ for little boys and little girls, you can expect a naming ceremony for a Reformed Jewish family to be held either in the baby’s home or at the synagogue. The child receives a Hebrew name – the name they will be called at every major milestone of their lives. From their first Consecration ceremony at the beginning of their religious education, at their coming-of-age bar or bat mitzvah, when they wed, when the are called upon in worship to read the Torah, and at last, when they die. The Hebrew name given at their naming ceremony will be used at their funeral. Then to be inscribed on their tombstone. At a Reformed Jewish naming ceremony, parents typically explain why it is that name has been chosen for their child. Blessings are said that remind all that this child has “entered into a brit, a covenant, with God. . . . The traditional wish is offered – that this child may grow into a life of study of Torah, of loving relationships, and the performance of good deeds” (https://reformjudaism.org/what-expect-baby-naming). Hindu naming ceremonies are considered sacred and elaborately performed on the twelfth day after an infant’s birth. For the first week-and-a-half of the baby’s life, no one but it’s mother and a helper – typically the mother’s mother – is allowed to touch the baby or mother. After a ceremonial bath for both infant and mom, relatives are invited to the home. In some Hindu cultures, the paternal aunt has the honor of naming her brother’s child. After the mother “wets the head of the baby with drops of water as a symbol of purifying the child,” the auntie “whispers the newborn his or her name in the ear and then announces it to the gathered family and friends.” After, in some Hindu communities, “the sacred fire is lighted and the priest chants sacred hymns to invoke the Gods in heaven to bless the child” (https://en.m.wikipedia.org/wiki/Naming_ceremony). . . . What beautiful rituals to welcome a new little one into the world! To ensure that child and all who will surround his or her life know how special the little one is. How cherished and honored and excited the whole community is to watch the life of that little newborn unfold – to become all that little one can be as a blessing to the world. The naming ceremony tells all how important this child is for the life of the world. It’s why we Presbyterians baptize publicly – at the time of worship, not in some separate private ceremony. Whether a newborn baby, a pre-teen, or an adult; we declare as a community that the one to be baptized must know their name: Child of the covenant, Beloved of God! As we acknowledge the one being baptized’s name, we are charged likewise to remember our own baptisms and be grateful! To call to mind our own name – beloved – lest the names of the world are left to resound in our heads. We all are beloved! And from the moment of our vows on, we resolve to live as those who know our own and show others’ their names too. I love this day and I love that it falls so close to the beginning of each calendar year. What better way to begin a new year than with this very important reminder? And today, being that it’s a first Sunday of the month too; we’ll re-affirm the baptismal covenant, then move into the joyful feast of the people of God. 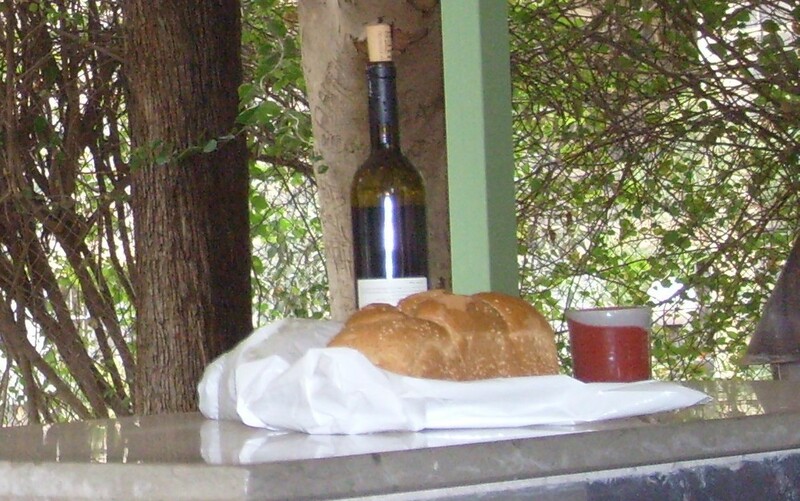 In the Lord’s Supper we’ll do what biblical scholar Walter Brueggemann calls a “regular re-performance of what we claim in baptism.” We’ll partake of “concrete, tangible signs of the generosity of God” (www.theworkofthepeople.com, “Faithful Practices,” Walter Brueggemann). We’ll eat of the food and drink of the cup that proclaims, in Brueggemann’s words, that we “belong to the narrative of Jesus and not the narrative” of the world (Ibid.). We will taste and know our names: beloved children of God who are “sealed as Christ’s own forever” (Ibid.). . . . It’s very good news! News that changes how we understand ourselves, how we interact with our neighbors, and how we resolve to live our lives this day and forevermore! Happy Baptism, brothers and sisters of Christ! Come now, to the font. Again, let us know our names! This entry was posted in Sermons and tagged 7 January 2018 sermon, Baptism of the Lord, Christian Baptism, Jesus' baptism, Mark 1:4-11, Naming Ceremonies, Rachel Held Evans, Reaffirmation of Baptismal Vows, The Work of the People, Walter Brueggemann on January 9, 2018 by RevJule.